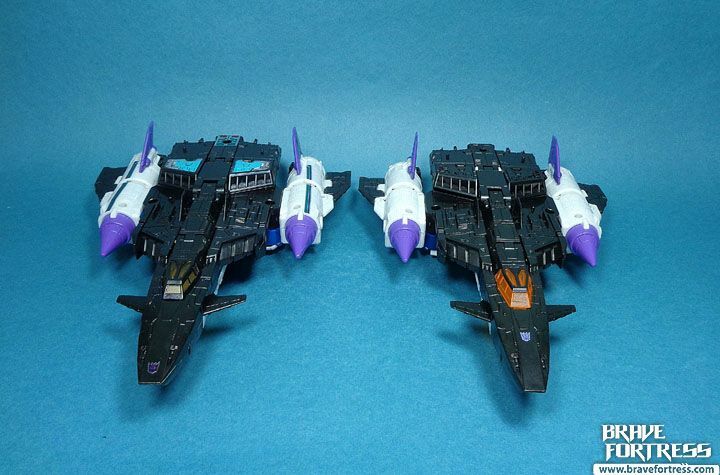 The Megajet can dock with the Gigatank, for transporting the latter. 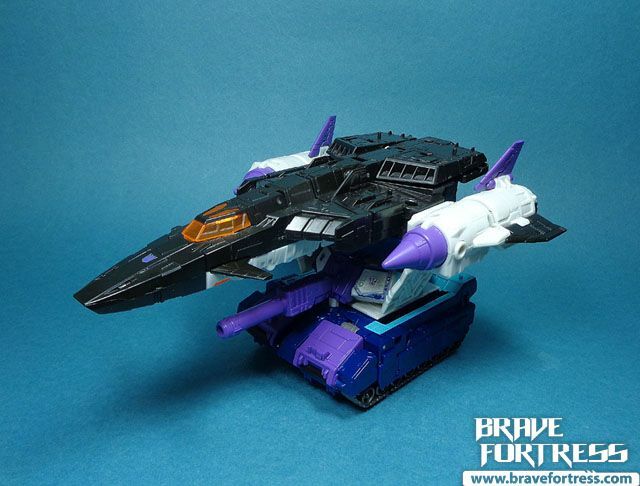 Docking is done via attaching Overlord’s chest panels to the tank. 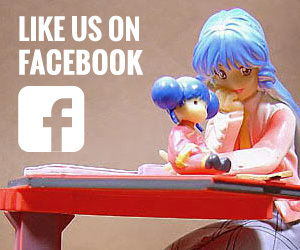 The husband and wife duo of Giga and Mega. 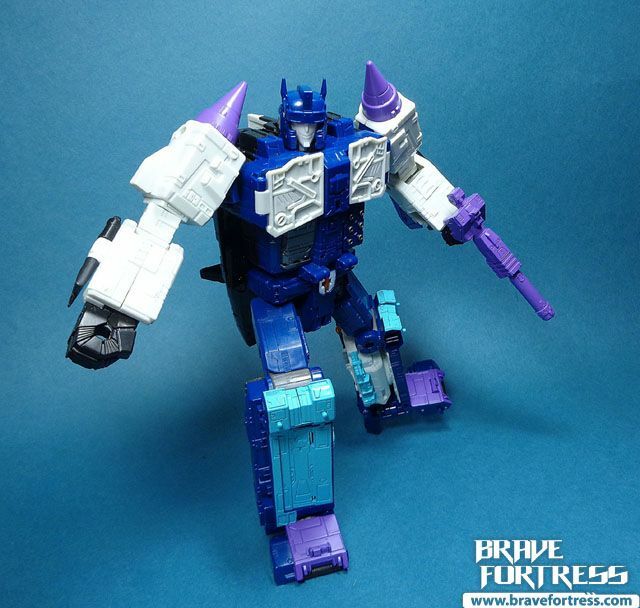 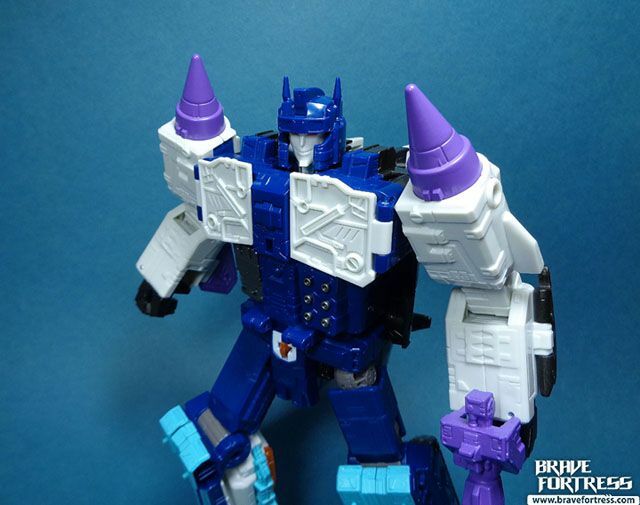 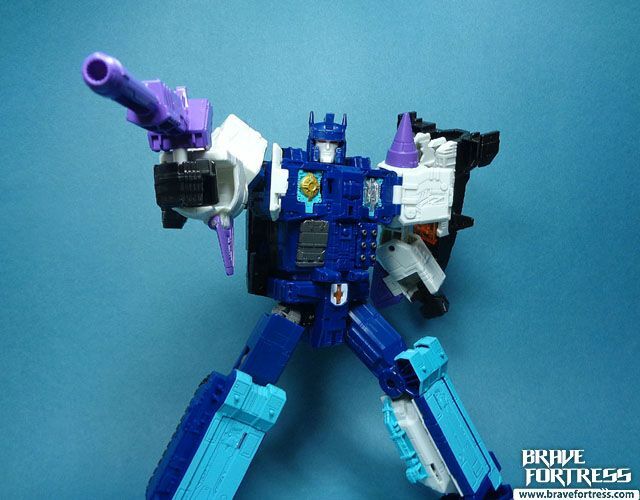 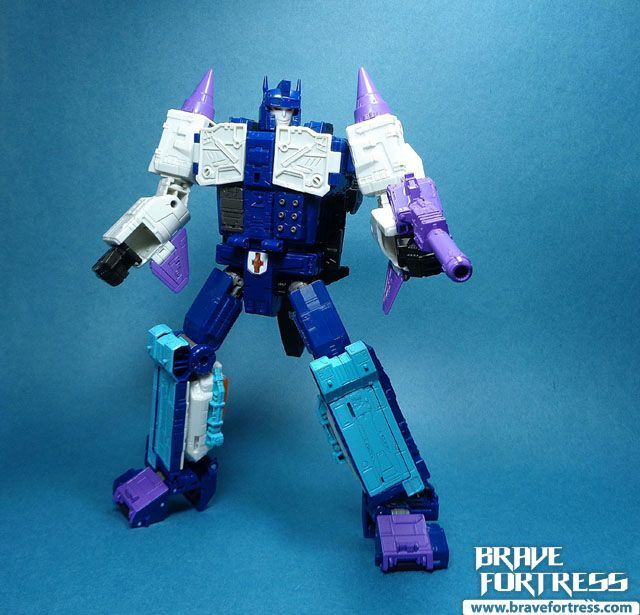 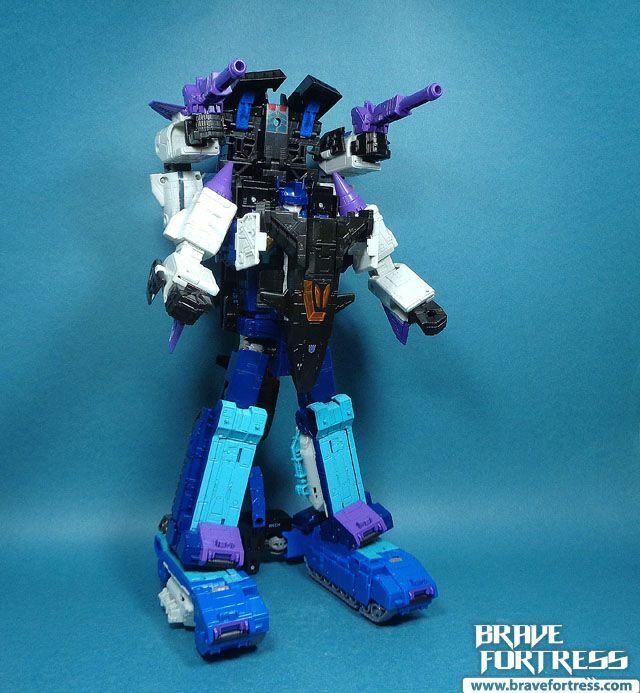 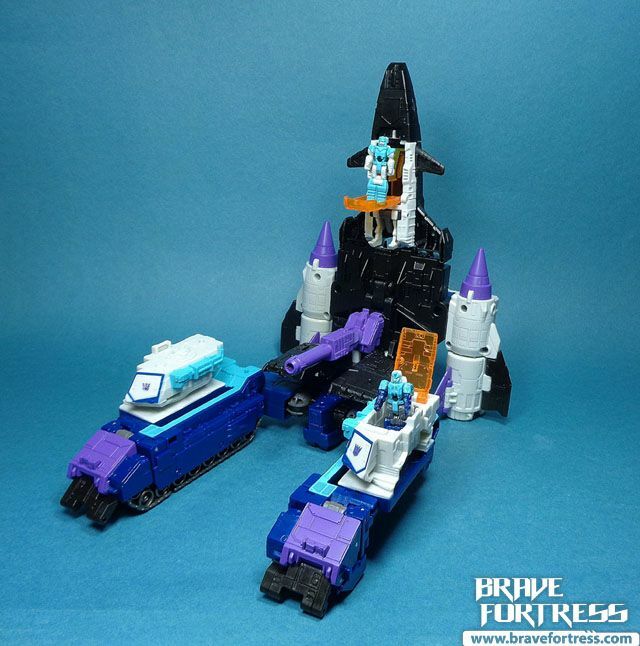 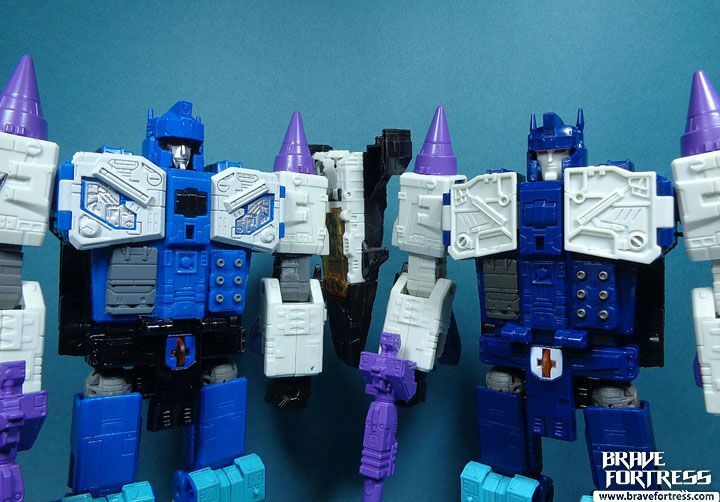 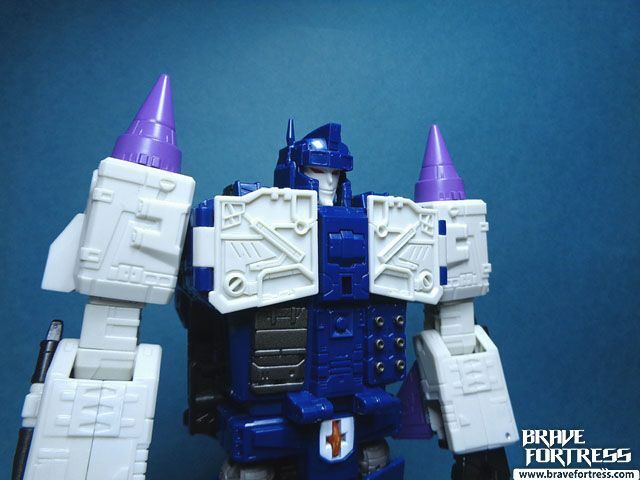 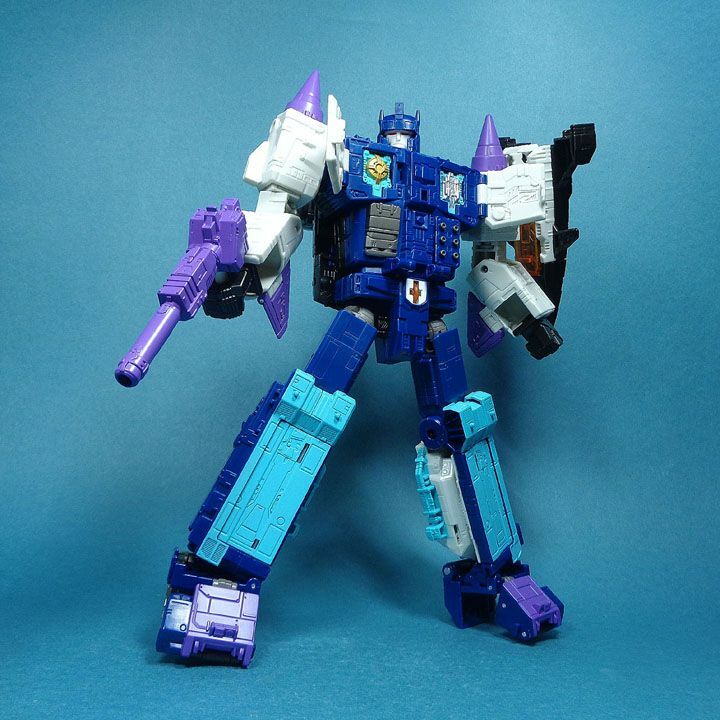 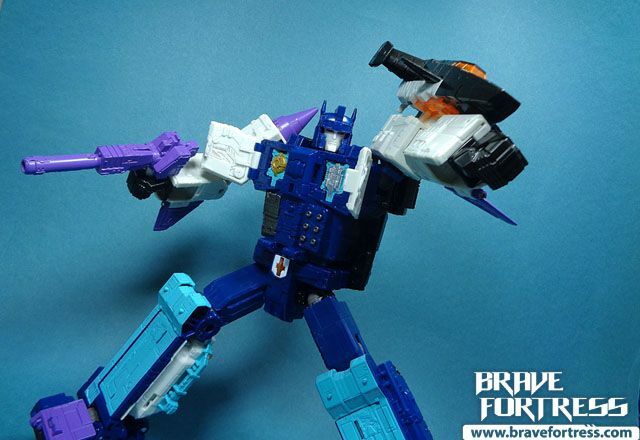 A new concept is executed for Overlord in the Takara Legends version. 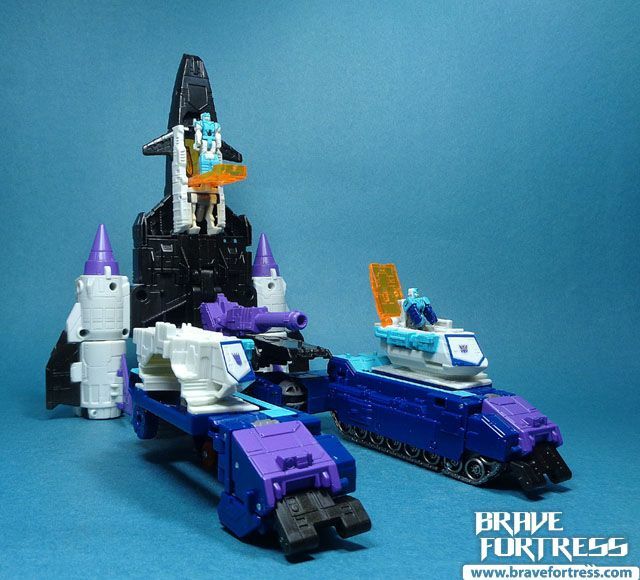 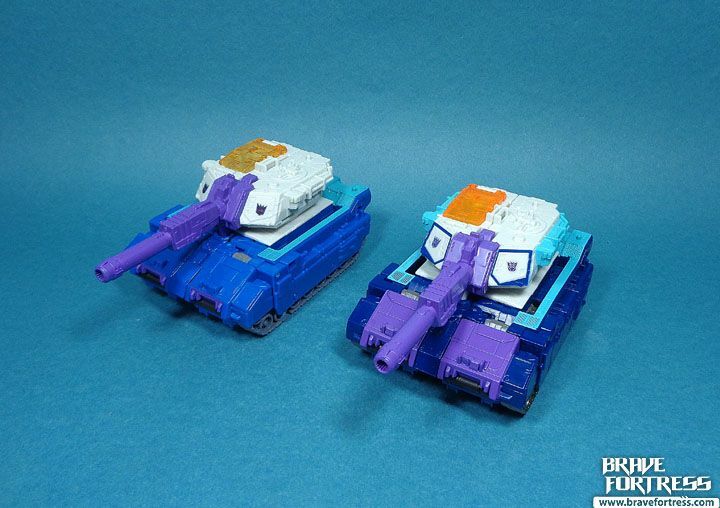 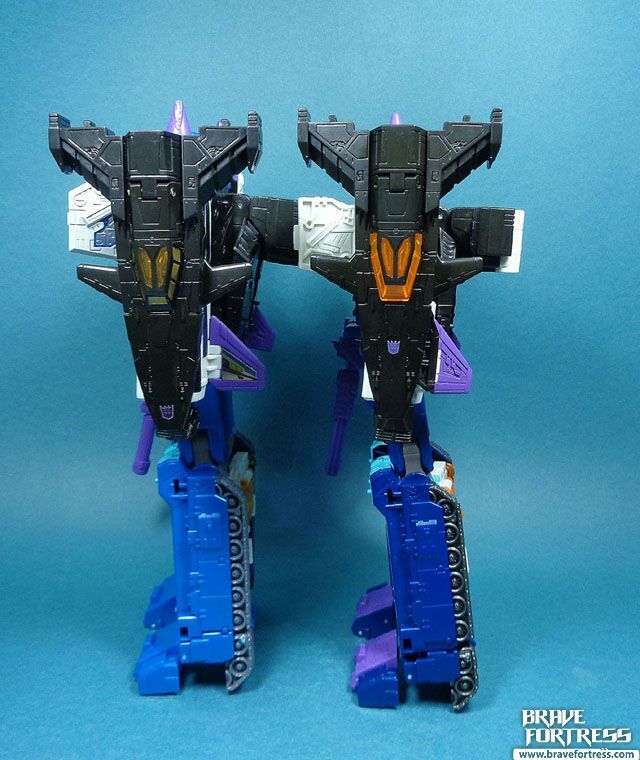 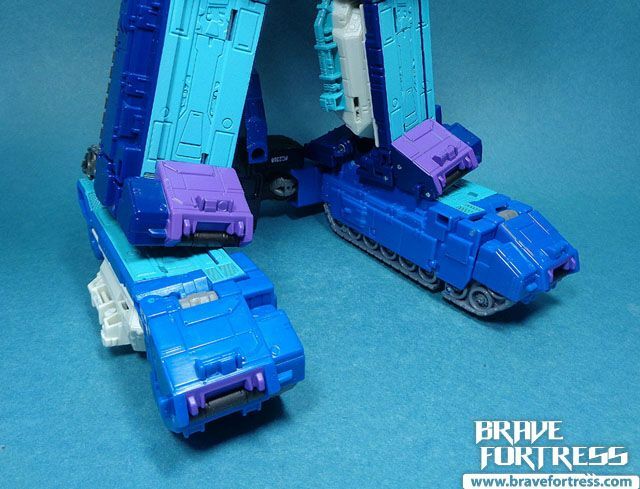 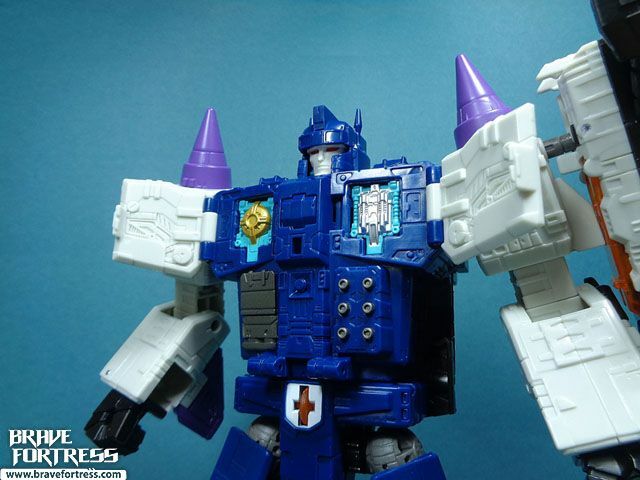 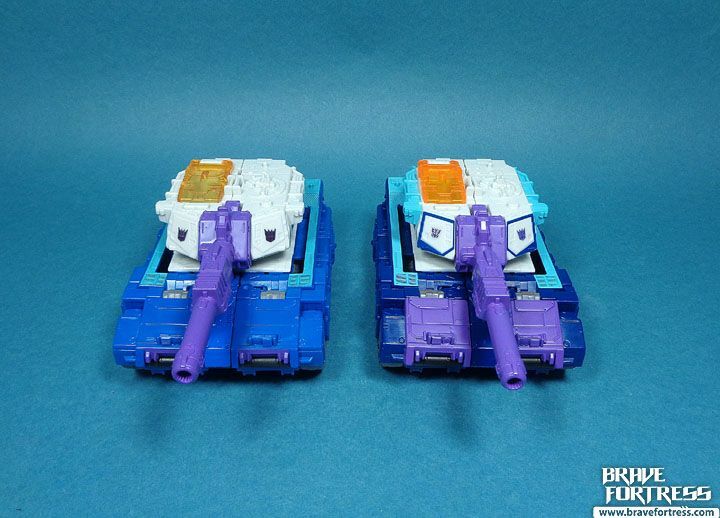 He has slightly different configurations depending on who is the Headmaster equipped on the Transtector. 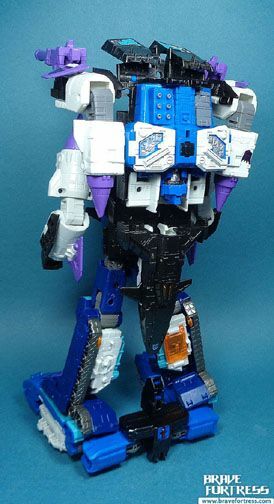 Overlord Giga has the chest panels open out and the Megachild jet attached to his arm. 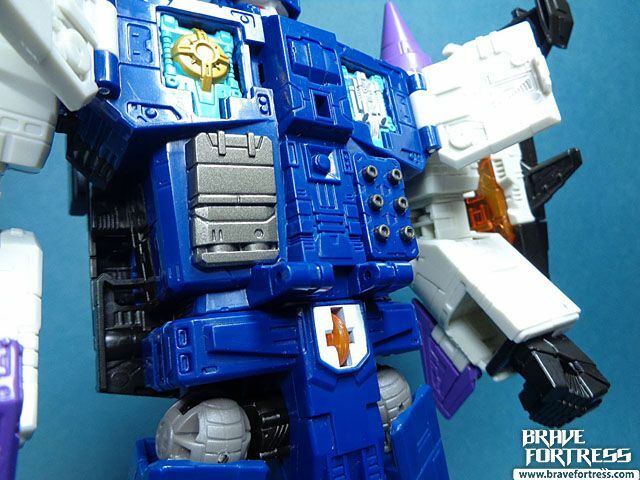 While the Overlord Mega configuration has the chest panels closed and the Megachild jet attached to his back. 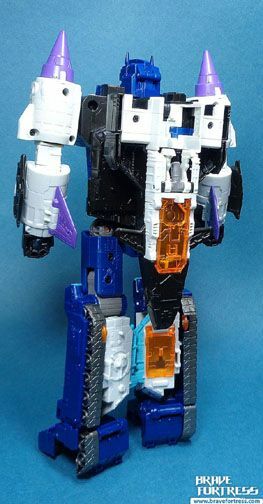 The manual indicates having the feet positioned like this to make him taller, as to make him a better match for God Ginrai I would reckon. 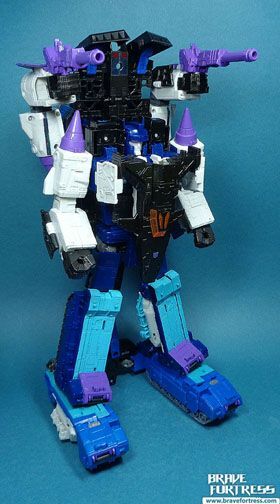 The problem is it kind of makes the toy less stable since he’s standing “tippy-toed”. 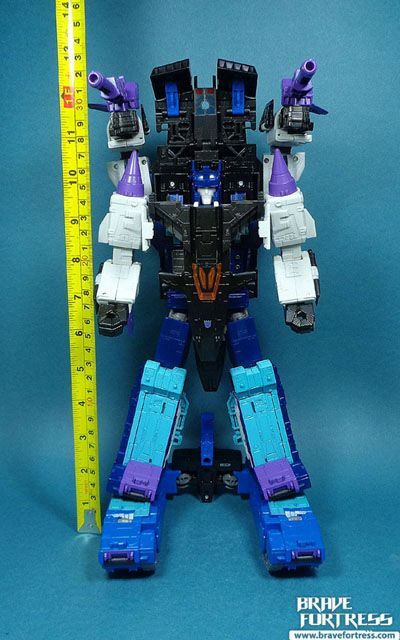 He stands roughly 10 inches when standing on his “toes”. 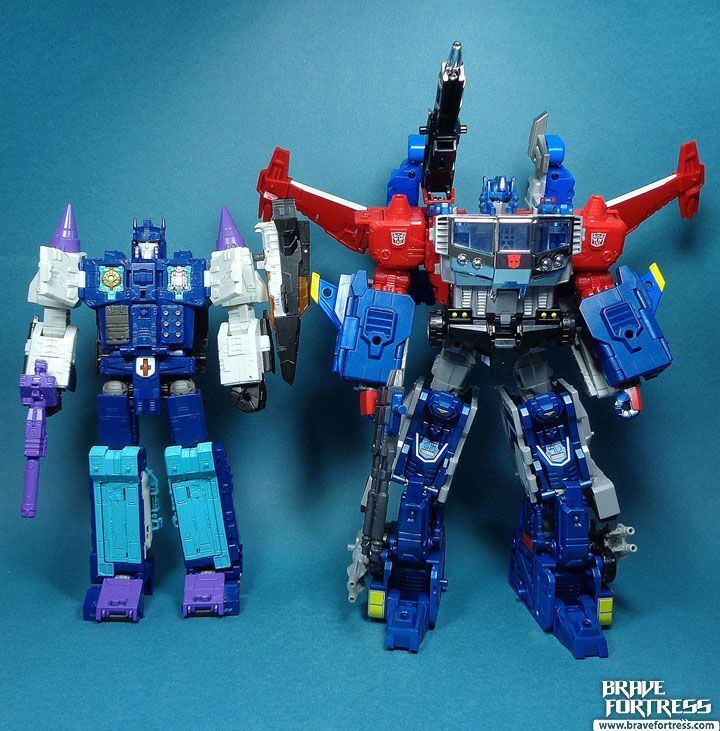 Even “tippy-toed” he’s still super short next to God Ginrai. 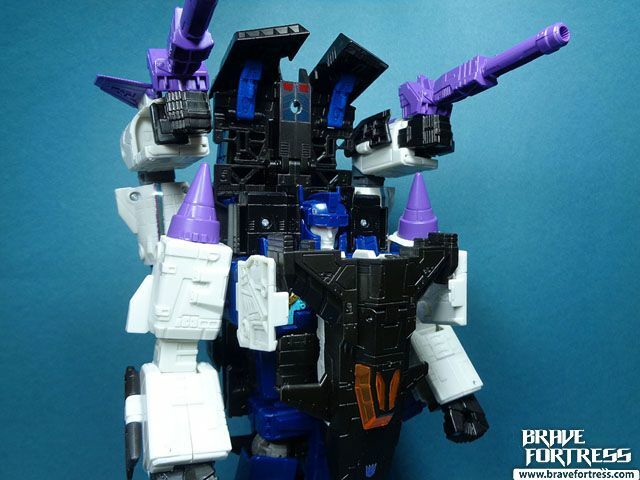 Aside from the Megachild, Overlord also can fire Chokon Bolt Masher grenades and Chokon Daemon Blasts lasers from his abs. 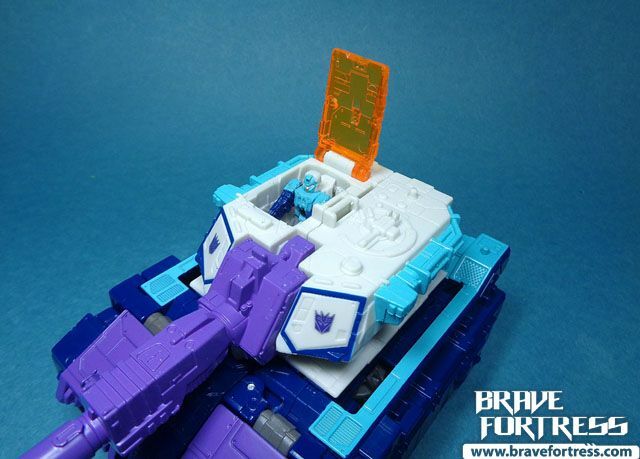 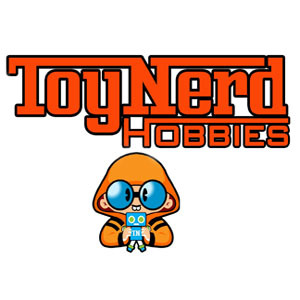 The toy includes a new attack called the Chokon Dis-Relieve missile barrage. 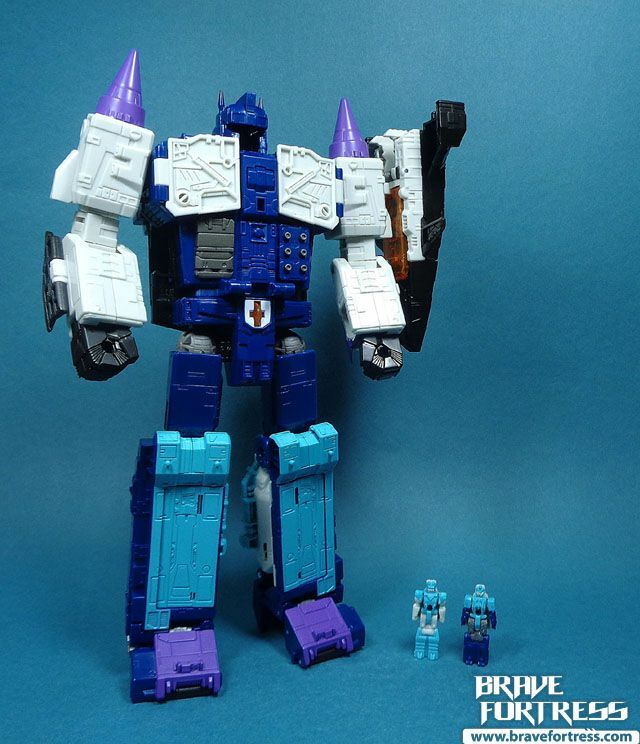 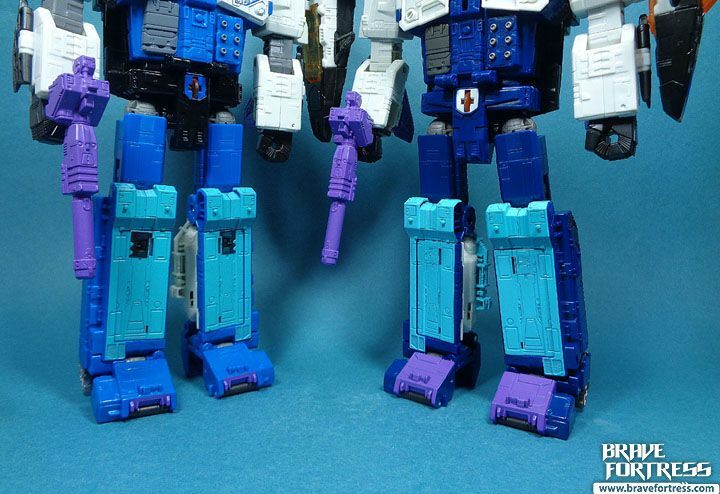 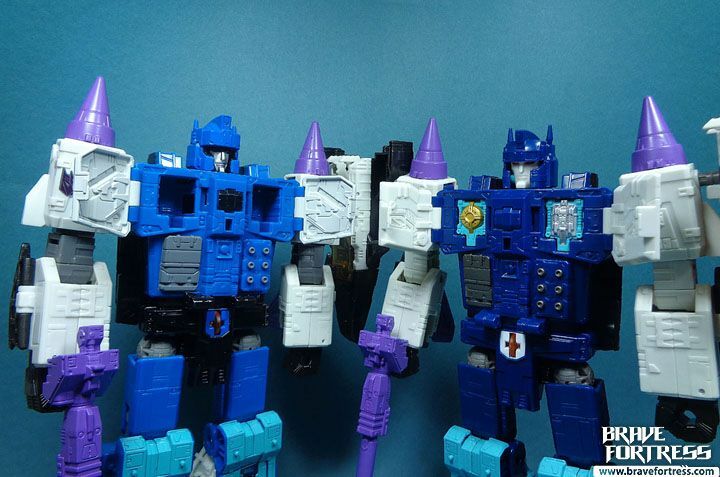 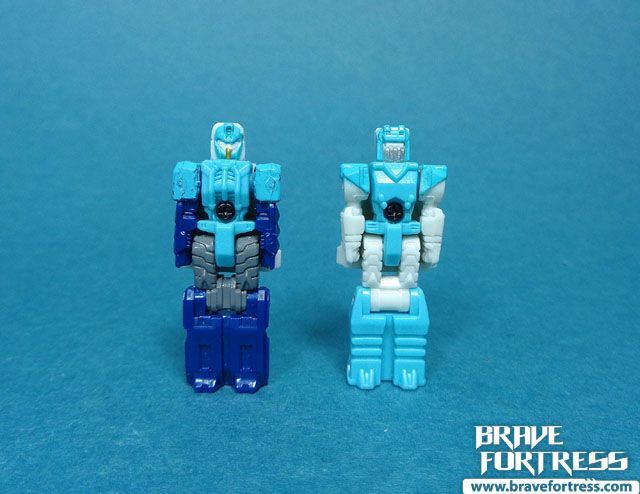 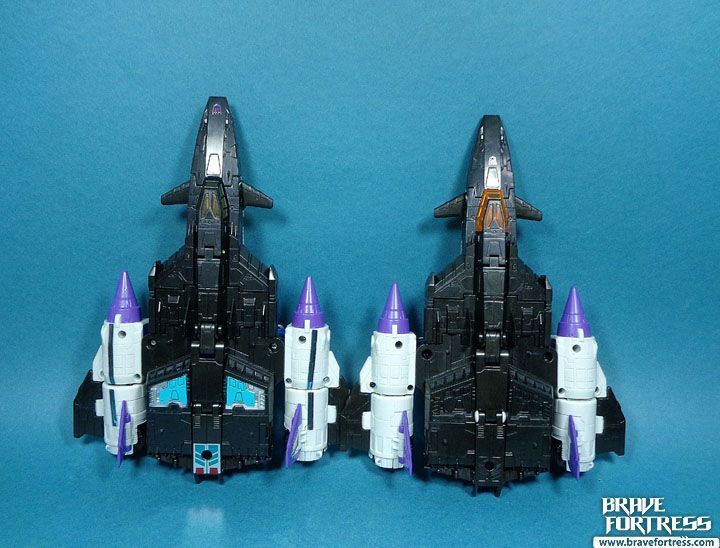 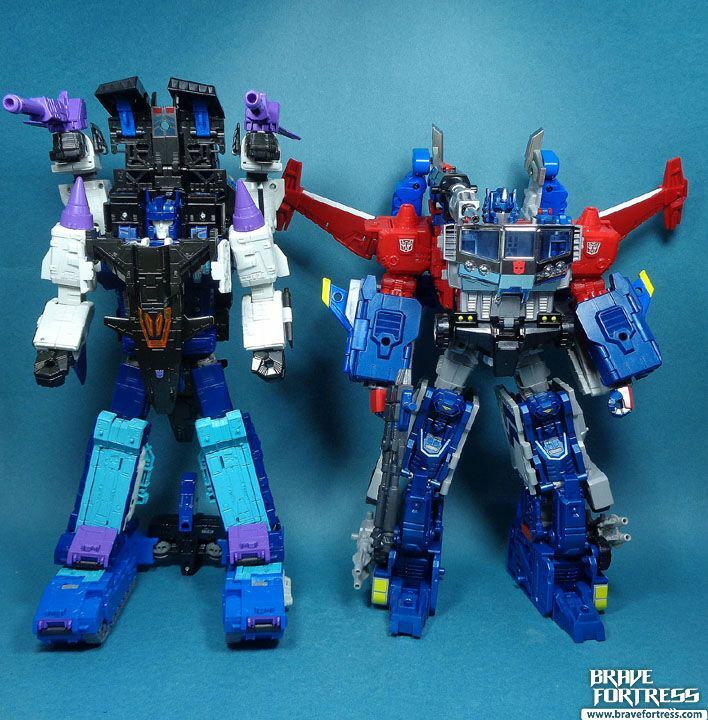 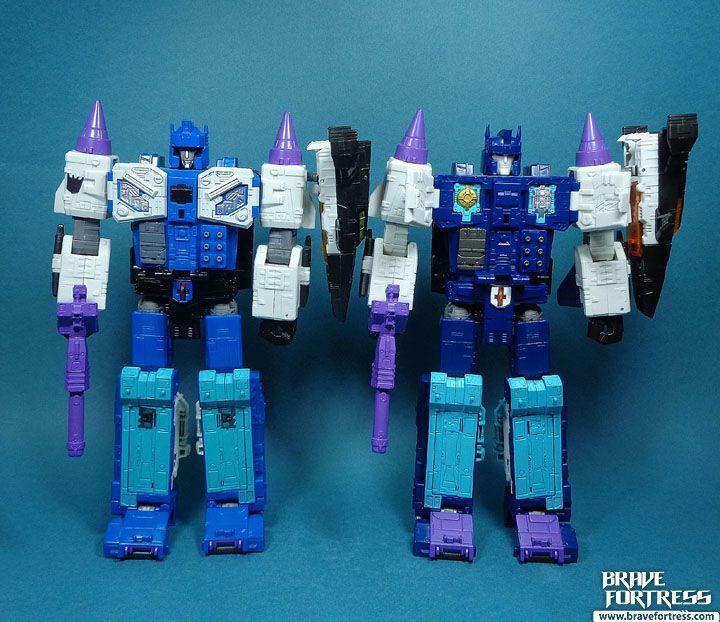 Comparison with the Hasbro version (Takara on the right). 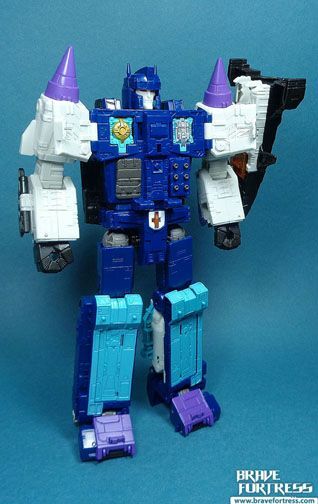 The helmet is totally resculpted to make Overlord more show accurate. 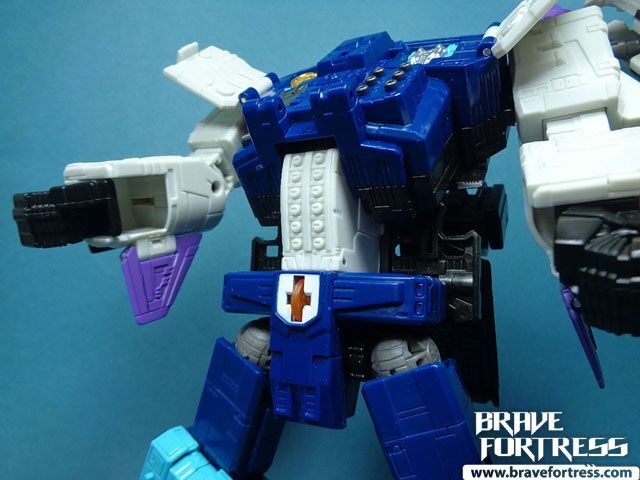 Originally, the chest cavities were empty for this figure’s mold (as shown in the Hasbro version). 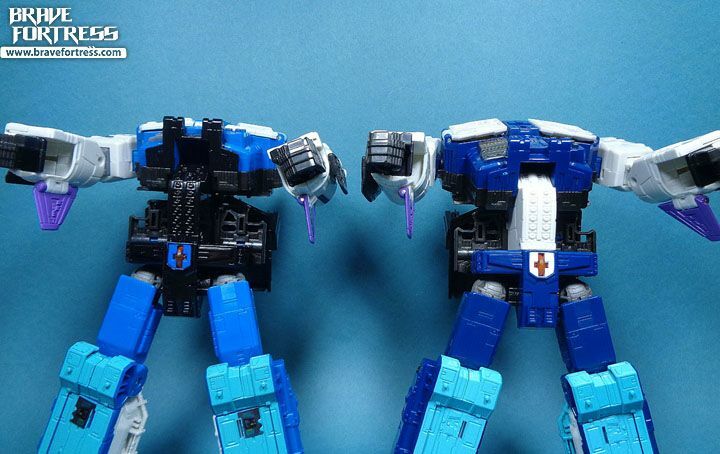 One was meant to plug Titan Masters/Headmasters into the cavity to recreate the Powermaster effect from the vintage toy, but the fit was too tight. 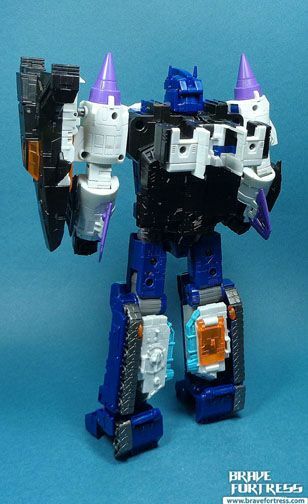 I’m really glad Takara just retooled it and put “Godmaster” engines in there instead. 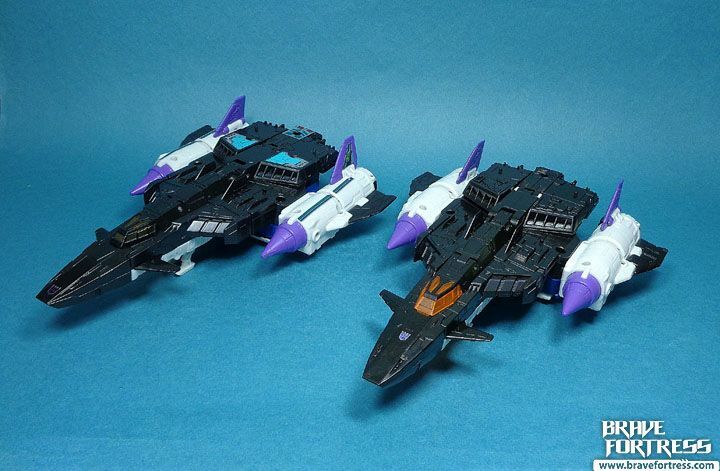 I’m not sure if they’re removable and I don’t want to try my luck at plucking them out. 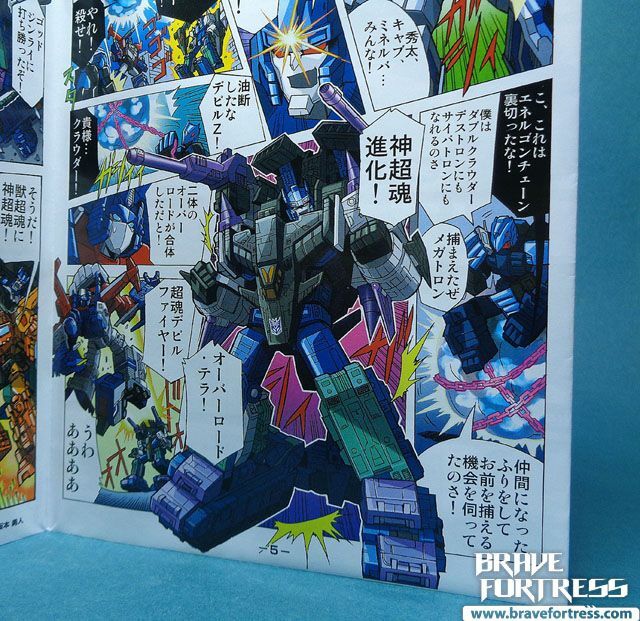 The pack-in comic also features a third configuration, where both Overlord Giga and Mega combine to form Overlord Tera. 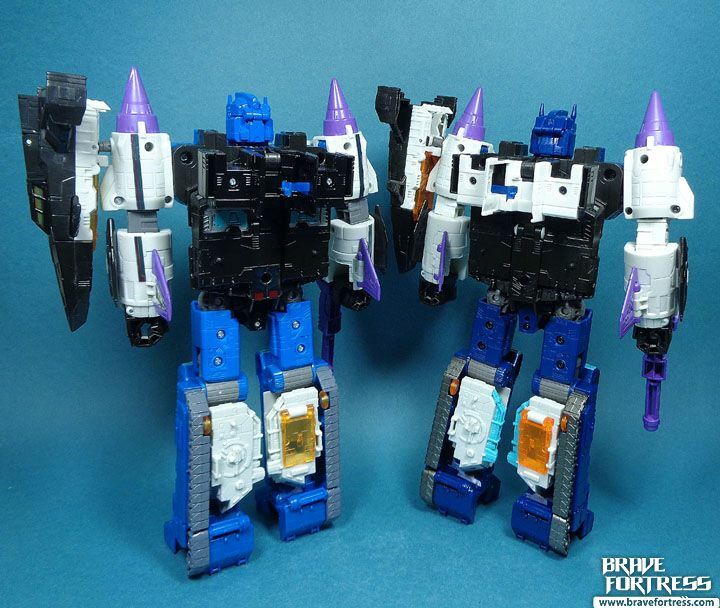 But this will require one to have 2 Overlord figures to work. 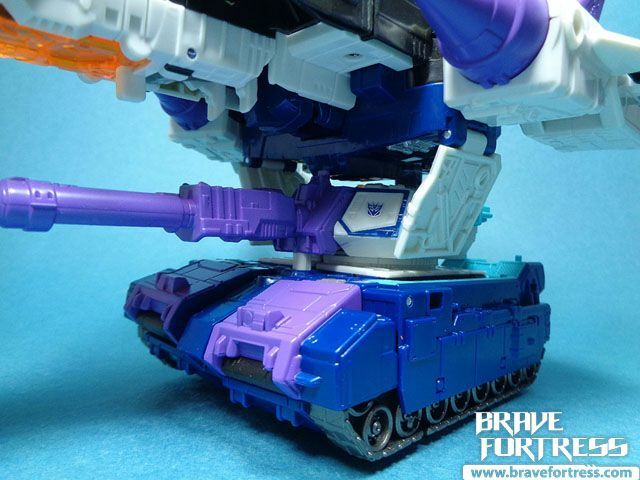 Now, since there’s no actual instructions on how to do Overlord Tera, I just went with what I saw in the manual. 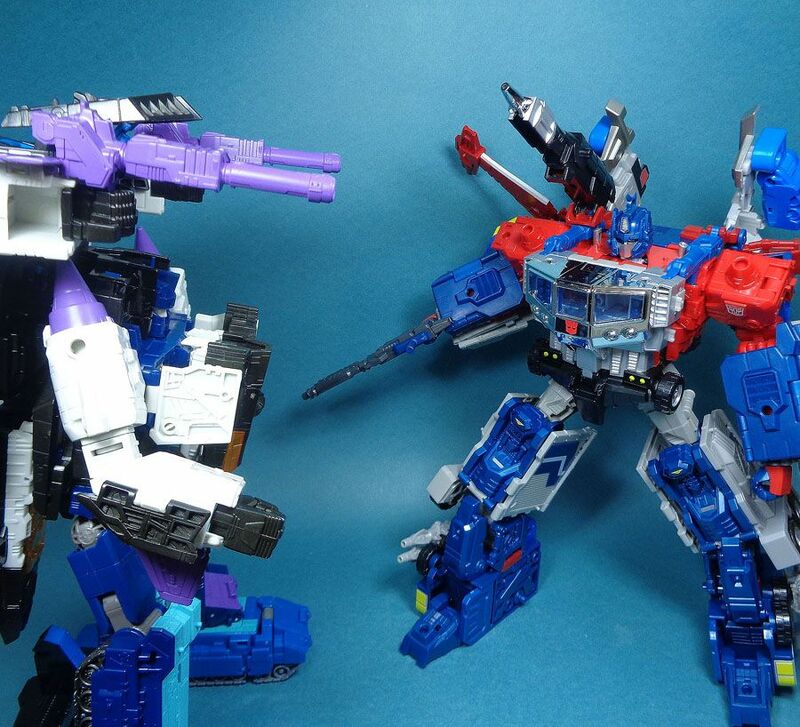 NOW he looks more in scale next to God Ginrai! 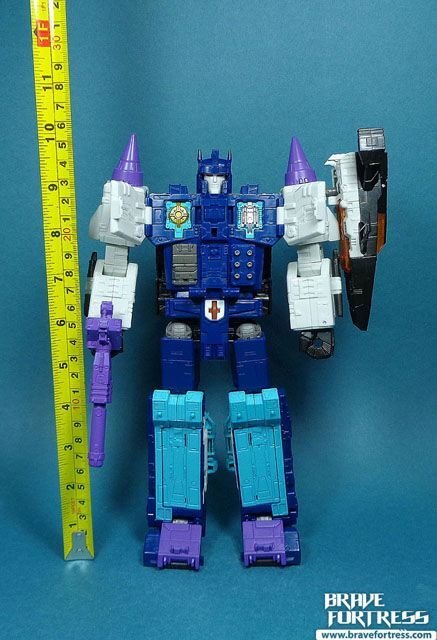 In this configuration, he stands roughly 13 inches tall. 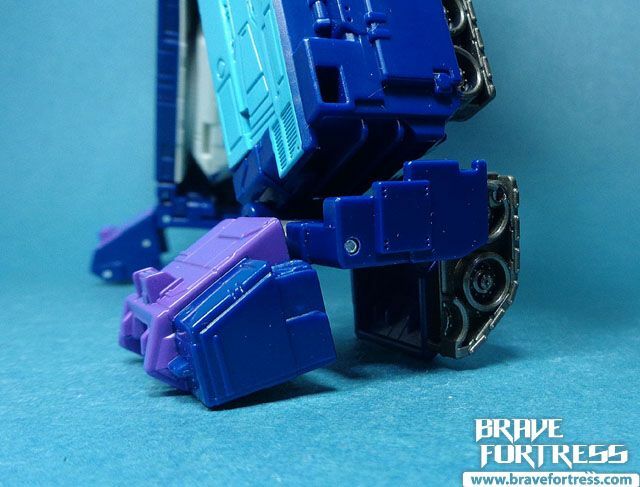 Unfortunately, since the feet aren’t really locked down, he can hardly be posed. 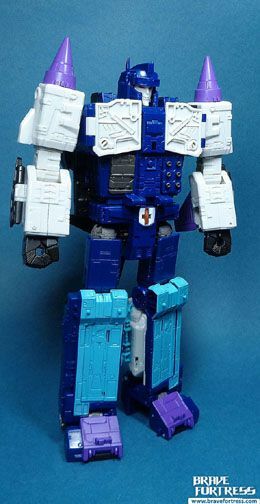 So he’s more like a brick right now. 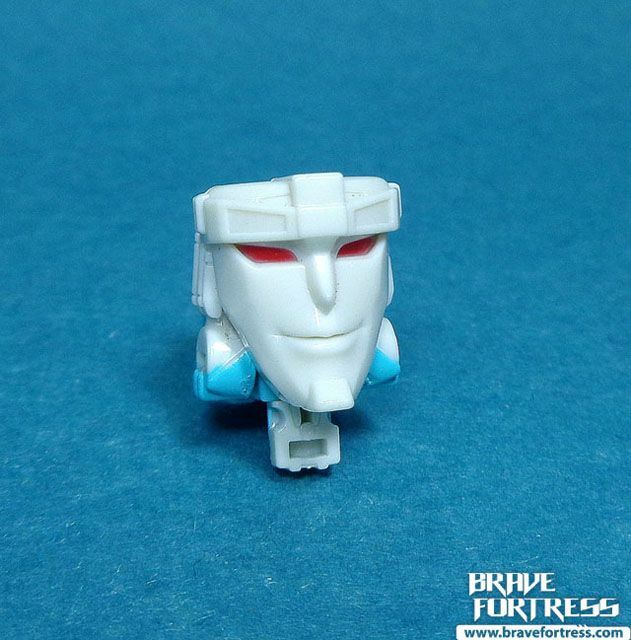 Still… he does look more menacing than usual. 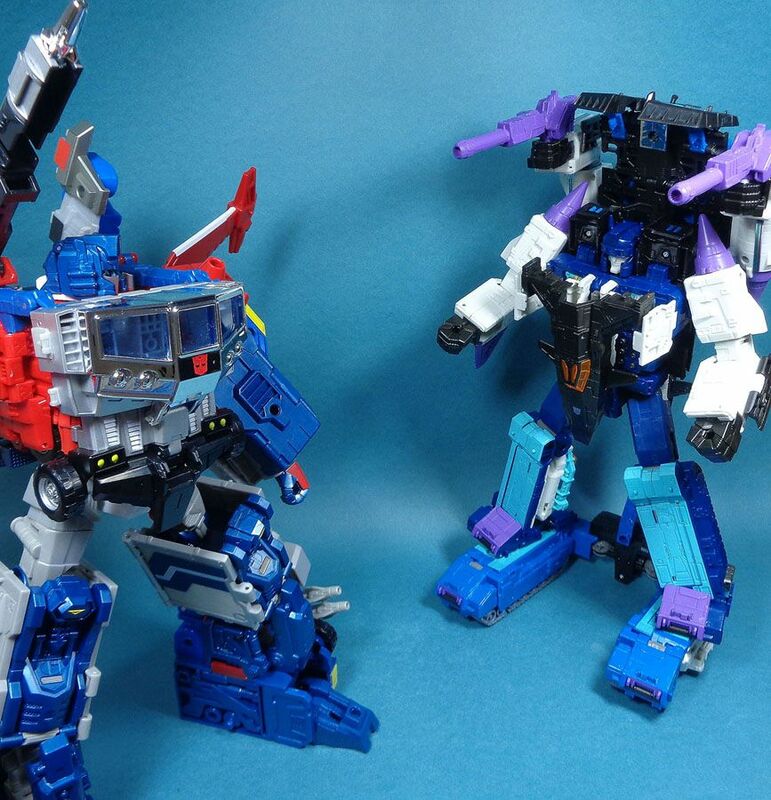 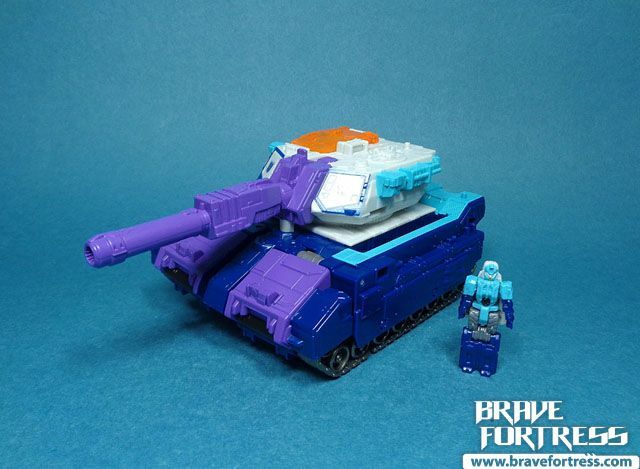 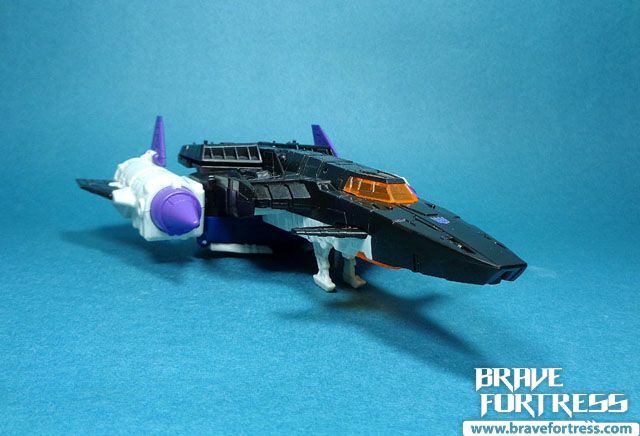 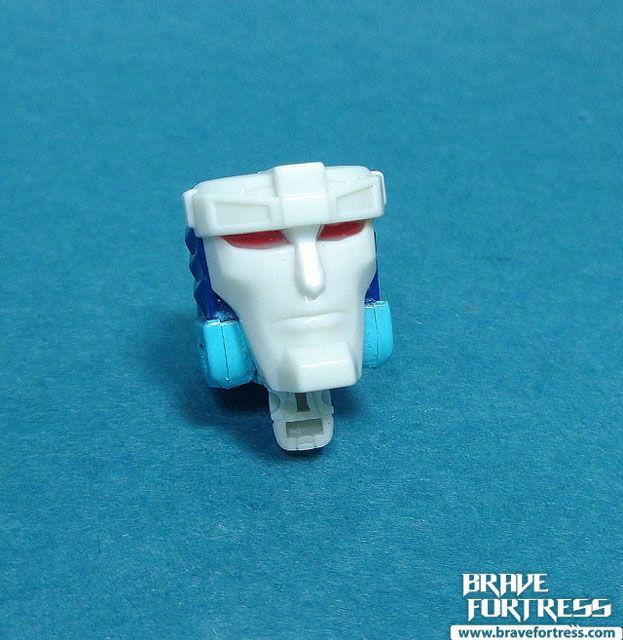 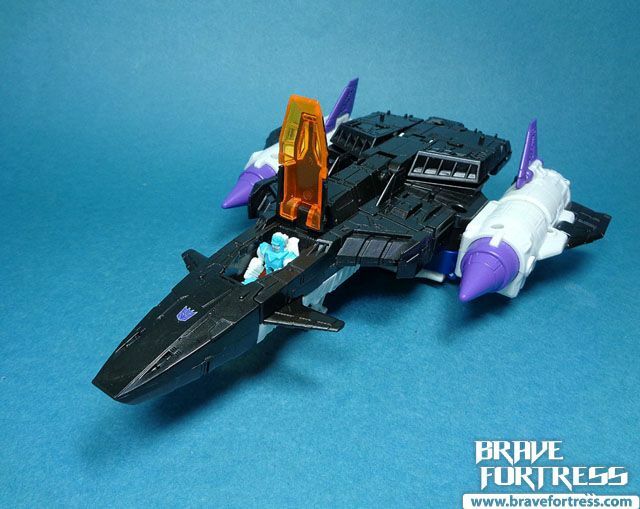 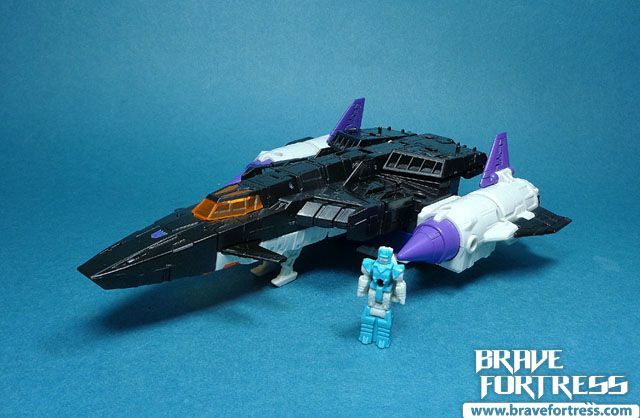 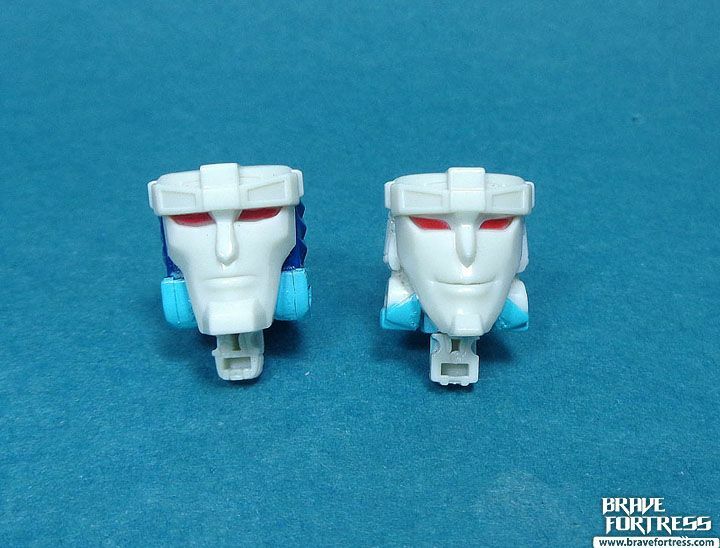 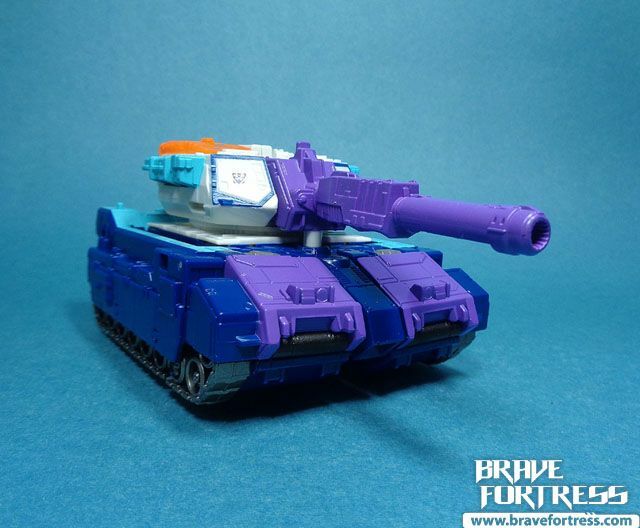 Hmm… to get a second Takara Overlord or not….